Divination is a way to know the past, present and future. Various methods of Divination have existed in many cultures around the world. In Tibet, various systems of divination have been used for thousands of years. Since the 8th century, when Buddhism began taking root in Tibet, these divination methods were re-framed in accordance with the laws of karma and the Buddhist principles of compassionate activity to benefit beings. According to these Buddhist divination systems, when a divination is performed, the practitioner enters into a visualization practice and invokes the energies or blessings of the deity associated with that form of divination. The practitioner is not acting as an oracle who is possessed by a deity, but rather, they are communicating with the wisdom aspect of the deity’s mind, which is none other than our own deep mind. This communication can occur through a variety of mediums, such as reading the patterns of crow’s flight, rock formations, the throw of dice, or on the surface of a mirror. How do I choose what to ask? We recommend that you take the time and carefully consider which questions you would like to ask His Eminence. It is very common to ask about the outcomes of business ventures, operations, marriages. You can also ask about choice of doctors or treatments for an illness or questions about your practice, lineage or whether it is auspicious to a particular retreat. All of these topics are acceptable. Provide your name, country/city, Tibetan astrological sign and a brief background of the situation. You can generally ask from 1 to 3 related questions in a session. Are the indications positive for me to marry Robert Jones? Would it be positive or negative for me to do retreat in December in Hawaii? Is my child, Betty’s health getting better? Rinpoche will then advise what the indicators seem to be positive or negative. And if it is not so positive, he may recommend specific pujas or rituals to be done on your behalf by his monks or for you to do certain specific mantras or practices. Who will conduct my divination? Namkha Drimed Rinpoche, amongst his many and various skills and abilities to compassionately aid sentient beings, is a divination master. With his Gesar of Ling arrow divinations he is able to very clearly and reliably predict the likelihood of success or failure, or the positive or negative likely outcome, of any situation arising in one’s life. If His Eminence is present in the vicinity where you are, please ask someone from Ripa Ladrang Foundation or ask one of his attendants if it is possible to make an appointment for a divination. If the divination appointment can be scheduled, then a date and time will be set for the appointment with Rinpoche. It would be important to arrive a few minutes early (not to be late) and to have your divination question(s) clearly formulated before meeting with him. If Rinpoche is not in the vicinity, and if it is urgent, it is possible to have a divination performed without being physically present. Note if Rinpoche is not in the vicinity all best efforts will be made to get an answer to you as quickly as possible. However, due to Rinpoche’s complex schedule no exact time guarantees on the response time can be provided. Your divinations will be performed, however, it could take anywhere from a couple days to a couple of weeks to get a response. 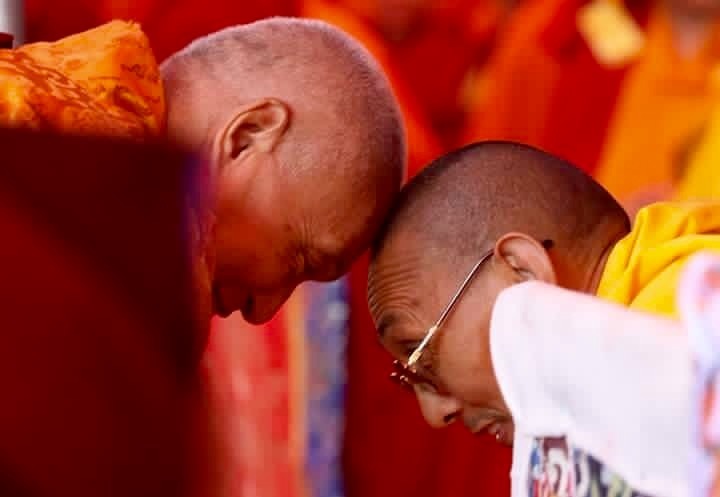 Usually it would be best to write down the question(s) so that his attendant can read it and have a record, additionally, in some cases Rinpoche may decide not to do the divination in your presence. It is not uncommon for him to receive your divination request, to discuss it with you, and then say that he will do it later and will notify you of the results. This is based perhaps on his own time schedule or something he sees about why he would choose to do it later. Whatever he chooses in this regard for the divination will always be for your benefit, so it would be excellent etiquette to accept his decision. Questions are generally written on a 3×5 index card or they can be on a larger card if there is some explanation to do regarding the subject in question. You can generally ask from 1 to 3 related questions in a session unless he does something different with you. But it would be quite OK to write down 3 questions. The format of the questions should permit a POSITIVE or a NEGATIVE response. You should not ask a question such as “Where should I do spiritual retreat?” or such as “Whom should I marry?” His divinations do not work in this way. The question should be worded in such a way as to permit a yes or no type of answer. Is my child Betty’s health getting better? Rinpoche will then advise what the indicators seem to be – positive or negative. And if it is not so positive, sometimes he will recommend specific pujas or rituals to be done on your behalf by his monks or for you to do certain specific mantras or practices. How do I get the opportunity to partake in a divination? 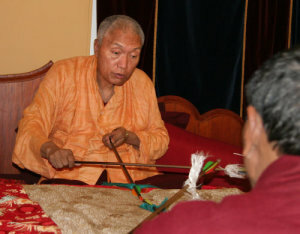 Typically during retreats or local visits to Sanghas, His Eminence is available to meet in person for a Divination. If you are meeting with His Eminence personally, it is customary to make an offering to him for the divination. Usually a white silk kata is offered to him along with a monetary offering in a white envelope for His Eminence and the translator. Often His Eminence will recommend pujas be performed on your behalf at one of our monasteries. Pujas are ritual ceremonies that can be very beneficial for your health, happiness or to remove obstacles you may be facing in life. If there are pujas that need to be performed there are standard costs associated with each type of puja. You can also pay for the cost of the puja by sending a check to the Ripa Ladrang Foundation, 333 Mamaroneck Avenue, #203, White Plains, NY 10605 and you should mark on the check “pujas”. Did you know that you may be able to double, triple or even add more to your divination gift? Check to see if your employer offers a matching gift program. Ripa Ladrang Foundation is an approved 501(c) 3 tax exempt religious organization. Federal Tax ID number is available on request.